an instrument used for direct visual inspection of hollow organs or body cavities. Specially designed endoscopes are used for such examinations as bronchoscopy, cystoscopy, gastroscopy, and proctoscopy. Although the design may vary according to the specific use, all endoscopes have similar working elements. The viewing part (scope) may be a hollow metal or fiber tube fitted with a lens system that permits viewing in a variety of directions. There is also a light source, power cord, and power source. Accessories that might be used for diagnostic or therapeutic purposes include suction tip, tubes, and suction pump; forceps for removal of biopsy tissue or a foreign body; biopsy brushes; an electrode tip for cauterization; as well as a video camera, video monitors, and image recorder. An instrument for the examination or surgical manipulation (for example, biopsy, resection, reconstruction) of the interior of a canal or hollow viscus. /en·do·scope/ (en´do-skōp) an instrument for examining the interior of a hollow viscus. An instrument for examining visually the interior of a bodily canal or a hollow organ such as the colon, bladder, or stomach. an illuminated optic instrument for the visualization of the interior of a body cavity or organ. Instruments are available in varying lengths. The fiberoptic endoscope has great flexibility, reaching previously inaccessible areas. Although the endoscope is generally introduced through a natural opening in the body, it may also be inserted through an incision. Instruments for viewing specific areas of the body include the bronchoscope, cystoscope, gastroscope, laparoscope, otoscope, and vaginoscope. See also fiberoptics. endoscopic, adj. A semirigid or flexible device with a long firm coil that is inserted into the region of interest, which has a light source, an optical system for viewing mucosa, camera, and a channel that allows insertion of sampling devices–eg alligator forceps, cup forceps, or curette for obtaining biopsies or surgical instruments to perform simple–minor surgeries. See Needle endosope, Sigmoidoscope, Stereoendoscope. An instrument for the examination of the interior of a tubular or hollow organ. An internal viewing instrument. 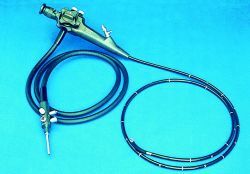 Modern endoscopes are steerable, flexible, cylindrical instruments with fibre optics for illumination and viewing and channels to allow washing of the area under view, suction, gas inflation to ease viewing, the taking of BIOPSY specimen and the use of various small operating instruments, including LASERS. An endoscope as used in the field of gastroenterology is a thin flexible tube which uses a lens or miniature camera to view various areas of the gastrointestinal tract. When the procedure is performed to examine certain organs such as the bile ducts or pancreas, the organs are not viewed directly, but rather indirectly through the injection of x-ray dye. 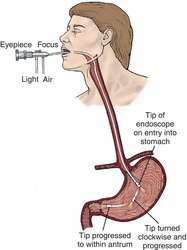 The performance of an exam using an endoscope is referred by the general term endoscopy. Diagnosis through biopsies or other means and therapeutic procedures can be done with these instruments. n an illuminated instrument that is used to investigate the interior of the intestinal lining via the mouth. Instrument designed to examine cavities which are not accessible for direct examination with the eye. It usually incorporates fibre optics to increase the flexibility of the instrument. 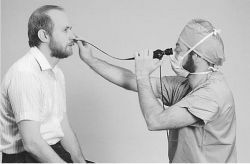 Examples: a laryngoscope which is introduced through the mouth to examine the larynx; an ophthalmic endoscope to examine the intraocular structures by inserting a fibre optics system through the sclera, as may be used in ocular surgery. an instrument used for direct visual inspection of hollow organs or body cavities. Specially designed endoscopes are used for such examinations as bronchoscopy, cystoscopy,gastroscopy and proctoscopy. Although the design of an endoscope may vary according to its specific use, all endoscopes have similar working elements. The viewing part (scope) may be a hollow metal or fiber tube fitted with a lens system that permits viewing in a variety of directions. The endoscope also has a light source, power cord and power source. Accessories that might be used with an endoscope for diagnostic or therapeutic purposes include suction tip, tubes and suction pump; forceps for removal of biopsy tissue or a foreign body; and electrode tip for cauterization. In patients with luminal wall thickening in the upper GI tract, 25 had endoscopically proven abnormal findings such as gastritis, duodenitis, and ulcers. Endoscopically CMV results in oedema, erythema and thickened folds, most prominently in the body and antrum. Clefts [classified as Veau I or II] can be treated endoscopically. AXID[R] Oral Solution is a treatment for endoscopically diagnosed esophagitis, including erosive and ulcerative esophagitis and associated heartburn due to gastroesophageal reflux disease (GERD) for up to 8 weeks. The patients--37 women and 23 men with an average age of 39 years--had clinically and endoscopically inactive ulcerative colitis, and all had experienced at least one prior relapse. All participants in the Glaxo Wellcome-sponsored trial had radiographically or endoscopically confirmed acute rhinosinusitis and a history of recurrent sinusitis or chronic rhinitis. We evaluated the diagnostic accuracy of esophageal symptoms in predicting Candida esophagitis in Ugandan AIDS patients with oral candidiasis and compared the effectiveness of miconazole and nystatin in treating oral and endoscopically proven esophageal candidiasis in these patients. Clinical question In patients with endoscopically diagnosed erosive esophagitis, is low-dose omeprazole safe and effective in preventing recurrence of disease? Synaero Hemostatic Gel is designed to be easily administered endoscopically to the nasal cavity and lightly coat the mucosal tissue to control bleeding. Lacrimal sac syringing was done with normal saline and free flow of fluid was observed endoscopically, nose was packed with Vaseline gauze and put on prophylactic antibiotics, patient was asked to come for review weekly once for first month and monthly once for 6 months. As in the operating room setting, a lighted guidewire is directed into the frontal, maxillary, or sphenoid sinus and confirmed to be in position endoscopically and by transillumination of the sinus (figure 2, A and B).